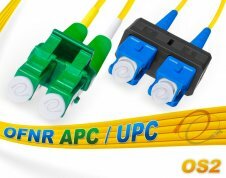 OS2 SC/SC Plenum Duplex Fiber Patch Cable 9/125 Single Mode OFNP. Plenum Rated, Self Extinguishing, yellow, 3.0mm diameter jacket. Corning SMF 9/125um fiber core/cladding, 2.5mm SC to SC terminated duplex fiber optic patch cable (includes duplex sc clips). 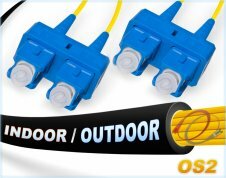 OS2 SC to ST 9/125 Singlemode Duplex Fiber Patch/Jumper Cable featuring Corning Optical Fiber with ceramic ferrule SC and stainless steel ferrule ST terminations. Yellow SMF zip-cord fiber jumper with 3.0 outer diameter OFNR PVC, riser rated, flame retardant, jacket. OS2 SC ST Plenum Duplex Fiber Patch Cable 9/125 Single Mode OFNP. 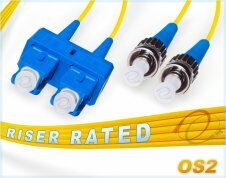 TAA, made in USA, plenum Rated, Self Extinguishing, Corning Singlemode fiber core, yellow 2.0mm jacketed duplex assembly, small form factor 2.5mm ceramic ferrule duplex SC fiber connector (w/ duplex sc clips) and duplex ST fiber Connectors. 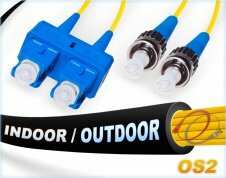 OS2 ST to ST 9/125 Singlemode Duplex Fiber Optic Patch Cable with Corning Optical Fiber and strong, stainless steel st/st connectors. Yellow jacket fiber jumper with zip-cord has a 3.0mm outer diameter, OFNR PVC, riser rated jacket. 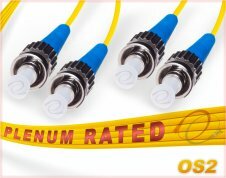 OS2 ST/ST Plenum Duplex Fiber Patch Cable 9/125 Single Mode OFNP. Plenum Rated, Self Extinguishing, yellow, 3.0mm diameter jacket. 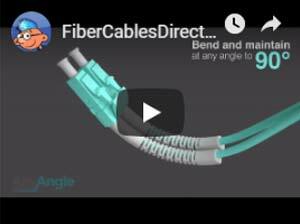 Corning SMF 9/125um fiber core/cladding, 2.5mm ST to ST terminated duplex fiber optic patch cable. 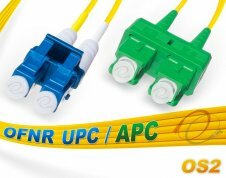 SC (APC)-SC (APC) Singlemode Duplex 9/125, 3.0m Thick, Yellow Fiber Optic Jumper/Patch Cable.